The ASB7128 is a high power, lightweight front-loaded vented subwoofer enclosure housing two of JBL's exclusive 2269H Ultra Long Excursion 18" Differential Driver woofers. This woofer features neodymium magnet, dual voice coils and dual gaps, JBL's exclusive Vented Gap CoolingT and ultra robust composite cone for high excursion and extra long life. 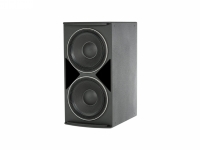 Woofer is capable of a peak-to-peak maximum excursion of 89 mm (3.5"). Long-Term System Power Rating 2400 W (9600 W peak), 100 hrs.